Yesterday evening, I was driving home after dropping my daughter off for an after-school activity and was listening to KIX 96.1, my favorite local Country music station. Lo, and behold, an advertisement for Ancestry.com aired during the commercial break. At first, I thought a country music radio station would be an odd venue for genealogy website advertising, but the more I thought about it, the more it made sense: just like Trace Adkins sang in his hit, Songs About Me, country music is "songs about loving and living and good hearted women and family and God." Isn't that what genealogy is, at the very root of it? Jessica Andrews sang "I am Rosemary's granddaughter, the spitting image of my father and when the day is done, my momma's still my biggest fan"--and that's what we discover as we trace our roots; we're not that different from the generations before us. Those of us with military ancestors or relatives can relate to Adkins' Arlington (a song that makes me cry every time I hear it) or Toby Keith's American Soldier. Most of us aren't descended from the rich and famous, nor are we ourselves. Most of our ancestors sang and played and listened to the music of the "common" people, the working class. Genealogy isn't just a pastime for the classical music and opera lovers only anymore; it's for the ordinary Joes who listen to rock 'n' roll, country, or even rap. So I had to smile as the commercial ended and the next song played. It was a good fit. Mary May Kimball, my 2nd-great-grandmother. She was born 27 March 1873 in Hesperia, Michigan, and her mother, Lucy May Dickinson, died at or shortly after her birth. Her father, Benjamin Henry Kimball, a Civil War veteran, had three other small children to raise. So her maternal aunt, Mary E. Dickinson and her husband, Phillip Weaver, raised little Mary. To avoid the confusion of two Marys in one household, to honor her biological mother, and because she was raised by her aunt and uncle Weaver, Mary May Kimball was also known as "Lula" Weaver. You can read more about Lula's life (and see a photo of her holding my father as an infant) on my website, AnceStories. To view the page correctly, you may need to set your screen resolution to 800 x 600 pixels. For PCs, right-click on your desktop, choose "Properties," then "Settings," then adjust the screen resolution size. I just posted a (very late) prompt at my journaling blog, Ancestories2. The theme this week is "The Significant Other in Your Life." Not everyone is married, in the traditional sense, to the love of their life. Next week's topic will focus on the traditional marriage with "Your Wedding." SALT LAKE CITY, UTAH-Early vital records of Nova Scotia, Canada, are viewable over the Internet for the first time and for free, thanks to a joint project by the Genealogical Society of Utah, FamilySearchT, and the Nova Scotia Archives and Records Management (NSARM). The records include one million names found in birth records from 1864 to 1877, marriages from 1864 to 1930, and death records from 1864 to 1877 and 1908 to 1955. Users can search the database at www.novascotiagenealogy.com. Nova Scotia is the first province in Canada to digitize all of its historical vital statistics and make them available online. "This project provides key information to researchers on their ancestors," said Genealogical Society of Utah regional manager Alain Allard. "It involves the vital records-births, marriages, and deaths-which are a key record set to find, identify, and link ancestors into family units." The Genealogical Society of Utah (GSU) first microfilmed most of Nova Scotia's vital records back in the 1980s. In 2005, GSU used FamilySearch Scanning to convert those microfilms to digital images, while at the same time capturing additional vital records with a specially designed digital camera. Volunteers for the Nova Scotia Archives then used the images to create the searchable electronic index, which was completed in 2006. Anyone can now search names in the index and view a high quality digital copy of the original image online for free at NSARM's Web site, www.novascotiagenealogy.com. In the near future, the index and images will also be available on FamilySearch.org. Researchers who want to obtain an official copy of a record can do so online through the Nova Scotia Archives. The cost will be CAN$9.95 for an electronic file and CAN$19.95, plus shipping and taxes, for paper copies. Nova Scotia Provincial Archivist, W. Brian Speirs, said the cooperation of GSU was crucial to this important project. "Without the Genealogical Society of Utah offering in the early days of the project to provide complimentary digitization of all the records as their contribution to the initiative, the proposed undertaking would have been dead in the water and gone nowhere," Speirs said. The 2007 Washington State Genealogical Society Conference is being hosted by the Wenatchee Area Genealogical Society on April 13 & 14, 2007, at the Wenatchee Convention Center. The theme is "Climbing Your Family Tree," and the featured speaker will be Sharon DeBartolo Carmack. This includes a bonus presentation on Friday, April 13, 7:00 PM, an "Interview of the World's Oldest Living Genealogist, Ole Smirnoff Bernatelli." "Flesh on the Bones: Putting Your Ancestors into Historical Perspective"
"The Silent Women: Bring a Name to Life"
"The Immigration Experience: From Steerage to Ellis Island"
"Love Letters, Diaries and Autobiographies: Let's Leave 'em Something to Talk About"
We had a great time yesterday at Scanfest! Seven of us participated in one way or another: Amy of Untangled Family Roots; Apple of Apple's Tree; Denise of Family Matters; Jasia of Creative Gene; Lee of The Amateurologist; Susan of Family Oral History; and myself. Susan and Denise introduced us to the Gizmo Project, a voice-enabled chat, and Lee tried it out for a bit. We were scanning photos, journals, and written articles. I'm not sure how much we actually accomplished, as we scrambled to try the new technology, and some of us were interrupted by family members; it also took a while to get everyone "hooked up." We learned that chatters using Yahoo! e-mail addresses could not be added to the conversation, but those using Gmail e-mail addresses could. Most of us used our Hotmail accounts. Denise suggested that we have a gabfest sometime soon to get the introductions out of the way and make the Scanfest more efficient. Susan suggested that we try a weeknight sometime. She and Lee each also mentioned having a chatroom set up, which is more universal for different platforms, rather than the instant messaging. These are great ideas, and I hope we can implement them. The point of Scanfest isn't so much to accomplish a huge amount of scanning at once; it's simply to give ourselves a much-needed kick start for these projects. Sometimes doing something like this is just what we need! We had a great time, and if you missed it, we hope you'll join us for our next one, scheduled April 29th. I'll host that one again, and Susan has agreed to host the one at the end of May. SALT LAKE CITY - FamilySearch announced today that the Pedigree Resource File (PRF) database has reached over 150 million searchable names. Along with the milestone achievement, a new feature has been added that allows users to view genealogical and extended information for deceased individuals in a familiar pedigree (family tree) format. Users can search or contribute their personal genealogies to the free database at www.familysearch.org. If you have a Mac, you needn't be left out. Here is a link for our friends with Macs to download Microsoft Messenger for Mac. If you already have Yahoo! Messenger, you can use it for instant messaging with us, and not have to set up a Hotmail account. Susan's animation says we will be scanning from 11 AM - 2 PM (PDT), which is a longer time than I had originally posted (12 PM - 2PM). I like her idea of a longer time frame! So to keep it simple, we'll "meet" at 11 AM, PDT. For those who don't get this message in time, that's OK; they'll meet up with us at noon, PDT. Next time, we'll get the word out on the longer time. Susan is also working on finding a chat service that would be more universal and work with all platforms. She will keep us updated. There's really nothing so dreary as sitting and scanning all those old photos, documents, and other ancestral ephemera. It takes time, it's mindless, and just plain boring, but it's also a necessary part of preserving our precious family heirlooms. As family historians, we often are the ones who inherit the family papers and portraits, and we are entrusted with the citation, preservation and storage for future generations. To make the task a little more interesting and fun, we invite you to join us next Sunday, March 25th, from noon 'til 2:00 PM, Pacific Daylight Time. We will "meet" online via Windows Live Messenger. You will need to have a Messenger account, for which you can sign up and download for free here. Then send me an e-mail (see my profile in the right-hand menu). I'll add you to my contacts list and the Scanfest Group. Or you can search for me--Miriam Robbins Midkiff--to add me to your contacts list, if you have Windows Live Messenger already (my Messenger address will be at hotmail rather than gmail). Last month, Lee, Jasia, and I met and had a great time scanning, chatting, and getting to know each other a little better. See my report here. We hope to see more of you this Sunday. You don't have to be a genea-blogger to join; just a love of family history and a willingness to chat with us about what you're scanning. See you then! And, omigosh! I just went over to Jasia's blog to link it to this post, and saw she has the greatest Scanfest animation! How cool! Me. No, I haven't suddenly (or slowly, for that matter, either!) become narcissistic. But it's the big one, the big 4-oooooooooh! And rather than mourn or bemoan the wrinkles and gray hairs that have been making their way into my life the last few years (which, by the way, I blame on my teenagers! ), I thought I'd celebrate in this, the month of women's history and International Women's Day! I've been reading a lot this month about some incredible, amazing, strong women, and hope someday, my descendants can say the same thing about me. I've just posted the newest prompt at AnceStories2: Stories of Me for My Descendants. The theme this week is "Your Daily Life." Wouldn't you love to have a record of the ordinary, typical things your ancestor did each day? While that may not be possible, you can provide one for your descendants. Join me in my journal journey! The 20th Carnival of Genealogy is up, and I think you'll enjoy the stories that have been posted. As stories of women are wont to do, they evoke a range of emotions from anger to questioning, inspiration to joy. Jasia's started quite a blogging tradition, and there are now 15 submitters to the carnival. But enough from me...go read! Emeline C. ROBBINS, born on this day in 1846 in either Cattaraugus Co., New York or Liberty Township, McKean Co., Pennsylvania to my 4th-great-grandparents, Joseph Josiah and Marinda (ROBBINS) ROBBINS. She was their second child and first daughter, and was named for Joseph's first wife, Emeline C. [--?--], which was a rather common occurrence in those days. Emeline's older brother was my ancestor, Charles. Younger siblings were Benson, Lee, Evaline, Frank and Willie. Emeline was apparently what we now call "developmentally impaired" or "developmentally disabled." In those days, people with mental retardation were called "mentally incompetent," or, as she was labeled on the 1860 U.S. Federal Census, "idiotic." Between 1865 and 1870, the family removed to Newfield Township, Oceana County, Michigan, near the village of Hesperia. Emeline remained at home, and of course, never married or had children. When her father died in 1905, her brother Frank and his wife Helen cared for their mother and for Emeline in their home. Frank and Helen had also helped to care for Joseph in his final years of blindness caused by sunstroke during his Civil War service and senility. It was a very difficult time, causing much stress on the family, and was described in Marinda's application for a Civil War veteran's widow's pension. Marinda died in 1912 at the age of 84. Frank died in 1916 (he hung himself). Emeline died the following year at Traverse City State Hospital, Grand Traverse Co., Michigan at the age of 71. Such tragedy. I would love to flesh out more to this story. If you've been kind enough the last day or so to vote to Fuel My Blog, I finally fixed the script so that it actually works now...and thanks! In honor of Women's History Month, International Woman's Day (March 8th), and as a part of the 20th Carnival of Genealogy, I'd like to present a biographical sketch of my maternal grand-aunt, Barbara Dorothy VALK. Barbara began her life on 30 July 1918 in Grand Rapids, Kent County, Michigan, the daughter of William James VALK and Agnes TUINSTRA, and the twin sister of John, who was stillborn. She was the youngest surviving child and only daughter of this marriage, having six older brothers: Jim, George, Bill Jr. (my grandfather), Chet, Oscar, and Ted. Her parents were first generation Frisian (Dutch) Americans, and she was named for her immigrant grandmothers, Berber J. (DeJONG) VALK and Doetje WIERSMA. Barbara had the red hair, blue eyes, fair, freckled skin and round Frisian build that many of the Valks inherited. When she was born that summer morning, the United States was still embroiled in World War I, and the deadly 1918 (Spanish) flu pandemic was just beginning. This virus killed between 50 and 100 million people (many of them healthy, young adults) over the following two years, leaving more casualties than the war itself. Many scientists believe that this particular strain of flu caused cytokine storms, a fatal immune reaction in which the body overproduces immune cells to ward off disease and ends up causing significant damage to body tissues and organs (not unlike what happens with T-cells and cancer). This was in turn followed by an epidemic of encephalitis lethargica, which left 5 million dead in its wake. The symptoms of this disease include fever, sore throat, headache, double vision, delayed physical and mental response, sleep inversion, catatonia and lethargy. In acute cases, patients may enter a coma-like state. Patients may also experience "abnormal eye movements, parkinsonism, upper body weakness, muscular pains, tremors, neck rigidity, and behavioral changes including psychosis," according to Wikipedia. Some scientists postulate that encephalitis lethargica may have been caused by the Spanish Flu. Barbara's mother, Agnes, contracted the flu and family oral history states that the illness "went to her brain." Whether she contracted encephalitis lethargica is unclear, but she was institutionalized in at least two mental hospitals until her young death in 1921 at the age of nearly 36 at Cutlerville Psychopathic Hospital, south of Grand Rapids. The cause of death was myocarditis (inflammation of the muscular part the heart caused by a virus or bacteria). In the 1920 Federal Census, we see the impact this illness has had on the family: Barbara and three of her brothers--George, Chet and Ted--are living in the Blodgett Home for Children. Their eldest brother Jim is living with their paternal grandparents; brother Bill is living with the Jaarstra family (probably family friends or as-yet-unidentified relatives). Brother Oscar has not been found in the 1920 Federal Census; he may have been living with a foster family when the residents of Blodgett Home were enumerated, and returned to the Home before his foster family was enumerated. Their father is living alone at home, and their mother is enumerated twice: the first time, in a residence a few blocks from their home, around the corner from the Jaarstra family, and enumerated as a "widow" (Jan. 7th). The second time (Jan. 21st) she is listed as an inmate at Mitchelt Cottage at Kalamazoo State Hospital. Nearly two years after Barbara's mother died, her father married a widowed first-generation German-American, Ida Eva (LAMBRECHT) SCHADLER, who had a young son from her first marriage. The family was reunited, with the exception of Oscar, who was raised by his foster family. Barbara's father and step-mother had eight more children--including another pair of twins--five of whom survived infancy: Jennette, Bob, Ray, and two daughters yet living. This family of twelve full, half-, and step-siblings, plus two adults surely must have crowded the home at 1006 White Avenue, N.W.! Barbara's father was an elder at an independent Bible church called the Tabernacle in Wyoming Park, southwest of Grand Rapids. Here she met Ruth HOEKSTRA, who was to become a lifelong friend. The Hoekstra and Valk teens shared many good times: Ruth's younger sister, Mary Lou, dated Barbara's brother Ted for a while, and Ruth started dating Barbara's oldest brother Jim, until Barbara told her he already had a steady girlfriend (Thelma, who he eventually married) in northern Michigan. Then Ruth began dating middle brother Bill, and eventually married him in 1943. Ruth and Bill's only child was my mother. Even after Bill and Ruth divorced, Ruth and Barbara remained steadfast friends. By this time, Barbara had attended Moody Bible Institute with the intentions of becoming a missionary, and was associated with the Africa Inland Mission. The portrait above was taken in Chicago and may have been her college graduation photo. Her brother Chet was killed during the Battle of the Bulge, and his 1944 obituary mentioned that Barbara was enroute to Africa. 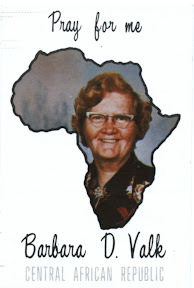 She first served in the Belgian Congo; in fact, her father's obituary of 1950 mentions her residence there, but she ended up spending most of the 38 years of African mission work in the Central African Republic. Barbara had an profound impact upon my mother. She was the main tie to the Valk side of the family, as my mother was raised by her mother and step-father. My grandmother was not too keen on having my mother spend much unsupervised time with her father's side of the family, as they had different family values. She would, however, let my mother attend family reunions as long as Aunt Barbara was there (on leave from mission work) to accompany her. I'm sure she was the inspiration behind my mother's desire to be a missionary as well. Later, when my parents were Salvation Army officers (ministers) working with Alaskan Natives, Aunt Barbara and my mother corresponded regularly around the globe. They had much in common. Both far from their families, living in remote areas with harsh living conditions, surrounded by people of differing races and cultures than their own, they found comfort in sharing their news, failures, joys, and prayers. As a stamp collector, I enjoyed receiving the colorful, foreign-looking stamps from Aunt Barbara's envelopes. Her letters were regularly written on beautiful stationery purchased from local natives who had drawn or created the decorative artwork. She once sent a gift of a set of cards embellished with flowers whose "petals" were made of butterfly wings. She wrote of the work she was doing among the native women and children. Many were living in surroundings of poverty, domestic abuse, alcoholism, and terror of local witch doctors. She did her best to educate, encourage, and empower them. Barbara was afraid of no one; she stood up to chiefs and witch doctors alike to protect her mission and the women and children she worked with. The girls in her school became highly sought after as wives because not only were they well-trained in domestic skills, but they were older and able to bear children soon after marriage (the traditional way was to marry off daughters while they were yet children). Barbara's life in Africa was not without upheaval. At one point, Africa Inland Mission abandoned the mission where she was working (perhaps due to the many revolutions in the country). 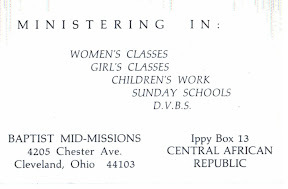 Although not a Baptist, she sought after and received permission from Baptist Mid-Missions to represent her and administer her financial support. She had to start all over with a new mission, school, and supplies from BMM. She went through many revolutions in the countries she worked in, resulting in expulsions or evacuations, and lost all her belongings, having to start all over each time. During the dark and dangerous days of the Central African Empire (a dictatorship), she entreated her family, friends and supporters for their prayers. Letters from her arrived heavily censored. A note my mother sent at the beginning of the regime included a question as to whether or not freedoms were being upheld by the new government; Barbara never received the message. In fact, mail service became completely undependable, and my mother dared not send any gifts or monies for fear they would be stolen before they reached her aunt. The dictatorship was later overthrown and things returned to normal, much to the relief of many. In the early 1980s, Barbara "retired" to a Baptist retirement community in Sebring, Highlands Co., Florida, called Maranatha Village. She served her co-residents for eight years, no doubt leading women's Bible studies and prayer meetings. She also traveled to visit family, friends, and those who had supported her during her years in Africa. A dear friend and companion in Florida was her first cousin, Doris Tuinstra. I remember Barbara came and visited her brother Ted in Idaho and our family in Northeast Washington one summer while I was working at a Salvation Army camp. She spent several days with my folks, and they stopped by the camp so that we could visit a bit, as well. Ever the missionary, she commended me on the work we were doing with low-income children in the Christian summer camping program. After eight years in Marantha Village, she returned to Grand Rapids to be closer to family as her health was deteriorating (she inherited the Valk tendency to diabetes). As long as she could, she visited and wrote many letters to her circle of loved ones, encouraging and exhorting. Some of her family members may not have appreciated her advice and admonitions (she was a woman of strong opinion), but they were given out of a sense of duty and love towards God and family. Barbara passed away on 13 January 2001 in Grand Rapids, survived by brother Ted, her half-brother Robert, two half-sisters, her step-brother, and many nieces and nephews. She truly was a part of the last generation of stereo-typical missionaries, for nowadays, mission groups have found it much more effective to train and send forth indigenous ministers to serve their own people. Nevertheless, a lifetime of work by this one--unassuming, straightforward--woman has had a lasting impact, literally upon the world. This good and faithful servant has gone to her reward. I have asked for my mother's help with this sketch in making sure the details of Barbara's life were accurate. In my latest e-mail to her, I wrote, "I really enjoyed doing this. By putting all the events of her life that I knew about in order, I got a better sense of who she was as a person. I wish now that I had had a chance to really know her better, but feel like I know more about her now then I did before I wrote this. I guess that's really what family history is all about...putting together the pieces of our ancestors' and relatives' lives and understanding them as real individuals, not just names and dates from long ago." My husband's sister, Mary. She's a fiercely private person, so I won't go into too many details of her life--like how old she is,etc.--but I did want to honor her and all she does. She is someone I've admired as a hard worker and strong woman, unafraid to voice her opinion. She keeps busy as a mother of two teenage daughters (which makes her a heroine, in my opinion, since I only have ONE teenage daughter, and sometimes it's enough to drive me to desperation! ), wife, homemaker, and secretary/receptionist for her husband's business. She also is a past Worthy Matron of her local chapter of the Order of the Eastern Star. Because my husband and his brother live on the opposite side of the state, most of the care and responsibilities of looking after their parents have fallen heavily upon her. When her children were little, she started a day care in her home so that she could work as a stay-at-home mom. She devotedly takes her parents camping at their favorite spot every summer (situated in the semi-arid wasteland of Eastern Washington). This involves the roughing-it style of tent camping; hauling in all water and necessities; watching for rattlesnakes, cattle and coyotes; and being at the mercy of 100+ daytime temps and near-freezing nighttime temps. After her father's heart attack over a year ago, she takes him walking every weekday to get his needed exercise, because his macular degeneration has caused him to be legally blind and unable to walk alone. Although she has a tough-as-nails exterior, I know at her core she is a compassionate, caring person, evident in her love of animals, and her concern for her parents, elderly neighbors and the senior members of her Eastern Star chapter. Bless you, Mary! *At our local LDS Genealogy Conference yesterday, I taught two classes twice: "County Genealogy Websites" and "Finding Volunteer (or Low-Cost) Researchers Online." Attendance was great at the conference; they were expecting 400 people, and I'm sure they exceeded it. Ugo Perego of Sorenson Molecular Genealogy Foundation was superb as our keynote speaker, and I participated in the free DNA sample project. I was able to meet fellow blogger Amy Crooks of Untangled Family Roots as well! There were many members of EWGS in attendance, as well as several people from the Online Genealogy classes I've taught through the Community College of Spokane, and even a co-worker who I invited from the middle school where I am employed. I'll have to blog more about this conference later. *I received the EWGS quarterly, The Bulletin (March 2007 issue), full of terrific articles as always. Found a couple of links to sites of interest. *I also received the May 2007 issue of Family Tree Magazine. Haven't had time to read it, but have glanced at a few interesting titles. I see Lisa Alzo has an article on Polish research. *One of my former Online Genealogy students e-mailed me with a question regarding how to properly use "dit" names (French-Canadian nicknames or aliases). I found some great answers at Genealogy.com; it was a learning experience for me, and has me wondering about my 4th-great-grandmother, Mary (LAMOUREAUX, also known as TERRY) WILKINSON, about whom I blogged earlier. Could she be French-Canadian? LAMOUREAUX is so very French. Is TERRY a dit name? *As a member of the Computer Class Education committee for EWGS, it's my duty to e-mail (or call) all those who've signed up for the computer classes with a reminder one week before class. I realized next Saturday is St. Patrick's Day, and the parade route and number of people downtown will definitely impact driving and parking, so gave a warning and a link to the parade map to help out fellow members with planning and parking alternatives. *We're getting ready to have some family time this evening. My husband's brother and sister-in-law have picked up a pizza from Costco to feed their youngest and our two kids (all teens) while they take Norm and I out for dinner to celebrate our March birthdays (his the 6th, mine the 19th). After dinner, we'll all head over to their place for dessert and birthday time and to call Norm's sister who lives on the West Side of the state to wish her happy birthday as well. Lillie (DAVENPORT) MIDKIFF, who was born on this day 130 years ago in Macon County, Georgia to Seaborn Ludwell DAVENPORT and Nancy JENNINGS. On 16 November 1894 in Arthur, Indian Territory, she married Thomas Oscar MIDKIFF, first cousin of my husband's great-grandfather, John Franklin Midkiff, Sr. Lillie and "Oscar" had 12 children--all of whom survived well into adulthood--and their incredible lives as a hard-working ranch family in West Texas have been documented in Mary Lou Midkiff's Midkiff: A Texas Family, Town and Way of Life. After reading this book, one can only shake one's head at the determination, courage, heartbreak, and endurance that cattle ranching in the west requires, along with the faith and support of an equally-tough ranching wife. A treasure trove of discovered family letters narrates the struggles and triumphs of this woman, her husband, their children, ranch and community. Lillie outlived her husband, dying at the age of nearly 95 on 23 January 1972 in Midland, Midland Co., Texas. She was laid to rest next to her husband two days later at Fairview Cemetery, Midland. She's baaaacckk! The inimitable Lee Anders is back, folks, with her new blog, The Amateurologist. And is the genealogy blogging world ever happy to see her again! Looks like she's added a number of posts from her old blog, and I join Randy in urging you to go on over and welcome her home. Today is International Woman's Day, and I invite you to read the stories I've written about the women in my husband's and my ancestry over at my website, AnceStories. A list of some of Norm's ancestors is here and my list is here. My sister-in-law also has a story of a great-great-grandmother here. None of the women featured in these stories were famous or did anything "extraordinary;" most lived quiet, hard-working, perhaps even heart-breaking lives, as have the majority of people throughout history. In turn, I'd love to read about the women in your family, so please post your stories or links, too! You may have noticed I'm not posting as many blogs. I certainly have much that I want to write about, but lately, time and energy have been at a premium. At work, we are undergoing a major yearly project called the WAAS - the Washington Alternate Assessment System. Our special education students are not able to take standardized tests due to their various physical and mental disabilities, but we must help them compile annual portfolios showing five examples of improvement in their Grade Level Expections for each of their subject areas, generally Reading, Mathematics, and Science. This is a very time-consuming, stressful process which has to be fit in around all our regular teaching, assessments, and grading, so when I reach home at the end of my workday, I'm utterly exhausted. Add in being a mother of two teens, with chores and homework needing supervision, as well as the inevitable chauffering of them to this or that meeting, function, event, or activity...throw in dinner, dishes and laundry, and I'm done (or done for!). Last Saturday was our monthly genealogy society meeting; this coming Saturday will be the annual free LDS Genealogy Conference; and the following Saturday, EWGS member Barbara Brazington will be presenting a computer class titled "Military Records Online." So you can see my weekends have been full, too. A friend gave me some genealogy resource books, and so before setting the alarm and turning off the lamp, I'll read a page or two in bed. Things will ease up again, and I'll be back in form before long. I'm looking forward to my Spring Break immensely (the first week in April!) because I know I'll have much more time to research and blog yet again. In the meantime, thanks for your patience, and thanks for reading. 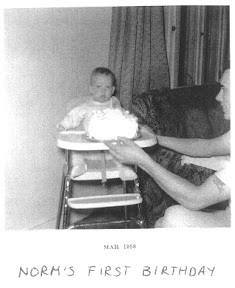 My sweetheart Norm, who is now officially a half-century old! 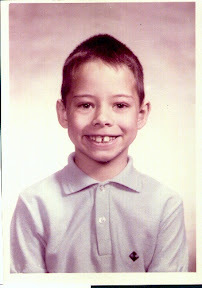 Below is a photo taken on Birthday Number One, forty-nine years ago, and below that is my favorite little-boy photo of him, taken in first grade, I believe. By the way, this particular birthday post doesn't quite fit in with the others. See if you can figure out the method to my madness...March madness, that is! See if you can figure it out...! Every once in a while, I stumble across a happy discovery in genealogy, usually when I'm least expecting it. Friday was one of those days. I was in a hurry, with a rushed before-work morning, trying to get things done because of the busy weekend ahead. I checked my e-mail, and was quickly scanning several messages from various RootsWeb mailing lists I subscribe to. For some serendipitous reason, I read through the entire message from the YORK mailing list, even though the subject heading was of no interest to me. It was a message gatewayed from the YORK message board, and mentioned a photograph of a grave in Bluebonnet Hills Cemetery, Colleyville, Tarrant Co., Texas. My grandaunt Shirley Marie (ROBBINS) HALL was buried in Colleyville, and that was all the information I had about her burial. Looking at Find A Grave had not been helpful, since there are 117 cemeteries listed at that site for Tarrant County, and although Bluebonnet Hills is listed as being in Colleyville, there are a number of cemeteries whose locations are simply listed as "Tarrant County, Texas." It's further complicated by the fact that Tarrant County is home of Fort Worth, so there are many cemeteries in the area. Doing a search on Aunt Shirley's name was not productive at Find A Grave, either. Anyway, I clicked on the link in the YORK mailing list and it took me to the Tea for Two website, which is subtitled, "Cemeteries Photographed in Texas, Oklahoma, and the World." It was there I discovered that a photograph of Aunt Shirley and Uncle Herb's shared gravestone had been uploaded to the site! That photograph also gave me Uncle Herb's birth and death dates. My next step is to obtain the phone number for the cemetery office using Qwest Dex, and then make a call. 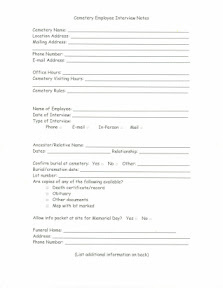 I've had a lot of success calling cemetery offices to get information, and I created a form to help me remember all everything I need to ask. If you would like a copy of this form, you can e-mail me (see my profile in the right-hand menu of this page), and I will send you one as a Word document. Willemke Gerryts ENGBRENGHOF, my 4th-great-grandmother, whose father, Jan Gerryt Martens ENGBRENGHOF, brought what little German ancestry I have into the family tree. Willemke's mother was Trijntje HESSELS, a Frisian, and daughter of a ship master. Willemke was born on this date in 1788 in the village of Marrum, municipality of Ferwerderadeel, Friesland, the Netherlands, the fifth of 11 children. She married my ancestor Gerrit Hendricks DOLSTRA on 29 June 1806 in Marrum, and they proceeded to have three children, all widely spaced apart. The youngest was my ancestor, Trijntje Gerrits DOLSTRA, who as a widow, emigrated to the United States in 1888 to live with her one surviving child, Tjamme Wiegers "James" VALK. Willemke died 3 September 1843 in Ferwerderadeel, and was buried three days later in the Marrum Churchyard. Although she was buried in Row 30, Grave 5, probably no gravestone exists, as the Dutch custom is to dig up graves after a period of many years, burn the bones, and thus leave room for new burials (in the Netherlands, land is at premium). One can pay more to have a loved ones' body buried for a much longer time before the necessary unearthing and subsequent cremation. In Willemke's case, her family must have been indigent, as the deacons' fund paid for her burial. 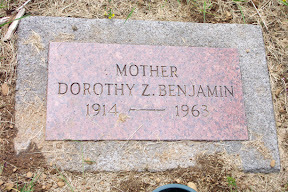 Dorothy Zada (MIDKIFF) JOHNSON BENJAMIN, my father-in-law's paternal aunt, who--if she had not died on 16 April 1963 at the young age of 49--would be 93 years old today. 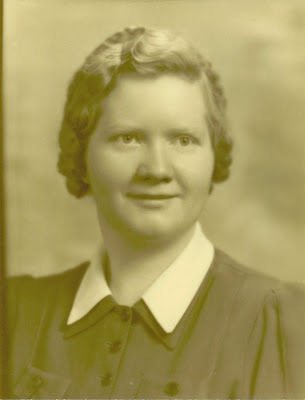 She was born on this date in 1914 in Idaho (probably in or near Challis, Custer County), the youngest of John Franklin MIDKIFF, Sr. and Margie Ethel TOLLIVER's three children. She also had four older half-siblings on her father's side. 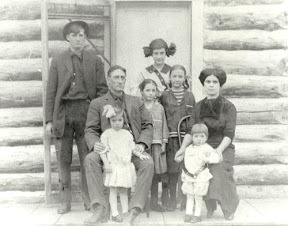 Below is a photo of Dorothy's family, taken about 1912. Taken before her birth, she does not appear in it. But this is the home in Challis in which the Midkiffs lived (click on the photo to go to the album and read the caption). Dorothy does appear in the photo below. 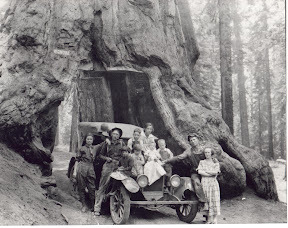 She is the little girl sitting on the fender directly in front of her father (again, click on the photo for captions). Maude Mae (HOEKSTRA) Van HARTESVELDT, who was born on this date in 1890 in Grand Rapids, Kent County, Michigan. She would be 117 years old today, if she still lived. As it was, she lived to be 101 years old! Maude was the second daughter of my ancestors Martin HOEKSTRA and Jennie TON, and my great-grandfather John Martin HOEKSTRA's older sister. She married Frederick Carroll Van HARTESVELDT on 1 Jan 1913 in Kent County, and they had at least three children, including a child who died around age 5. While she lived in Detroit during the 1940's, Maude lived for many years in Sedona, Coconino County, Arizona. She died in Arizona on 2 Nov 1991. Great-great-grandmother Doetje "Dorothy" (WIERSMA) TUINSTRA. She was born in the municipality of Wonseradeel, Friesland, the Netherlands in 1854, and would be 153 years old today. Daughter of Wijbren Joukes WIERSMA and Akke Dirks RENEMA, she immigrated to the U.S. probably in 1884 with her widowed father and many siblings. 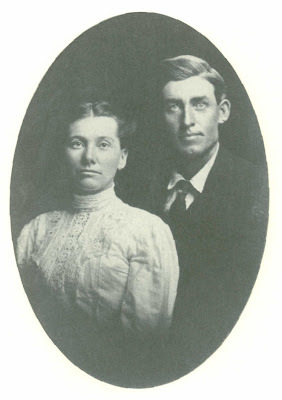 On 6 Nov 1884, she married Geert "George" Aukes TUINSTRA in Grand Rapids, Kent County, Michigan. They had 10 or 11 children (unclear), including my great-grandmother, Agnes TUINSTRA. Dorothy died 5 Dec 1916 at her home at 1332 Maude Avenue, NE, Grand Rapids at the age of 62. She was buried in the Grandville-Wyoming Cemetery, Wyoming Township, Kent County, Michigan. Read her obituary here and see her grave photo on her memorial page at Find A Grave here.